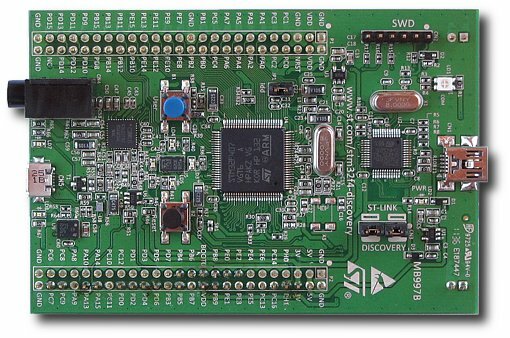 The STM32F4-Discovery evaluation board from ST Microelectronics is a low cost board for evaluating the STM32F4 range of 32-bit ARM Cortex-M4 microcontrollers. It is priced at around $20 US. The only piece of hardware required to start using the board is a USB type A to mini-B cable and a spare USB port on a PC. If the USB OTG port is to be used then a USB type A to micro-B cable will be needed. Alternatively the open source GNU ARM toolchain can be used to program STM32 microcontrollers. One example is YAGARTO for Windows. Soldered on the board is a STM32F407VG microcontroller packaged in a 100-pin LQFP (Low-profile Quad Flat Pack). This microcontroller contains a ARM Cortex-M4 core with FPU (Floating Point Unit). This microcontroller is part of the STM32F4 Hi-performance and DSP series of Cortex-M4s from ST.
An embedded ST-LINK is included on the STM32F4-Discovery evaluation board that can be used to program the on-board STM32F407VG microcontroller. The embedded ST-LINK can also be used to single-step through source code and debug the target microcontroller. The board features four user programmable LEDs and a user programmable push-button switch. A second push-button is connected to the reset pin (NRST) of the microcontroller. The STM32F407VG is also interfaced to an Audio DAC and MEMS microphone. A stereo audio jack is on board for connecting headphones or speakers to the audio output of the DAC. The board has one USB OTG full speed port available on a USB micro-B connector. A three-axis linear accelerometer is interfaced to the board. All of the I/O pins of the STM32F407VG are available on pin headers. Two 25 by 2 (50 pin) headers are located on either side of the board along its length, one per side. The pin names are silk-screened next to the pin headers. The pin headers protrude from the top of the board allowing easy attachment of oscilloscope or logic analyser test probes. Although the STM32F407VG has two internal RC oscillators, a 8MHz crystal is used for the main oscillator. There is place on the board for a 32.768kHz crystal which is not fitted. 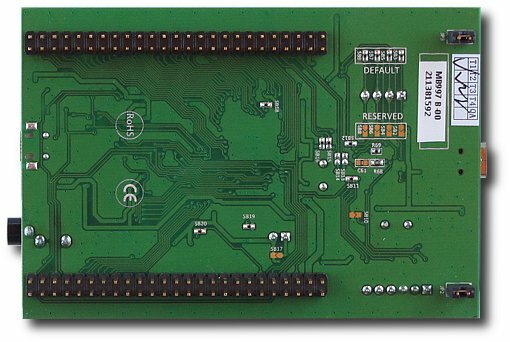 The board has a number of solder-bridge connectors that can be soldered closed or de-soldered to open them in order to make or break connections. Plugging the board into the USB port of a PC will provide power to the embedded ST-LINK and the STM32F407 microcontroller. The board can also be powered from a external 5V supply. After plugging the board into the USB port of a PC, the pre-programmed firmware will run. This program flashes the four user programmable LEDs on and off. If the user programmable push button is pressed, then the LEDs are used to display the status of the accelerometer. Tilting the board in different directions will cause the corresponding LED to light up. The STM32F4-Discovery evaluation board is an excellent board for learning and evaluating the STM32F4 range of Cortex-M4 microcontrollers from STMicroelectronics. With many on-board peripherals already interfaced to the microcontroller, it provides an opportunity to write some interesting code without the need to add extra external hardware. If external hardware does need to be interfaced, it can be connected to the two 50 pin headers on the board.